Changes are Coming in the Wireless Mic World! We live in a wireless world – and it isn’t just microphones. Our mobile phones, tablets, e-readers, cameras, GPS units and other devices keep us in constant wireless contact with each other, the internet, our files in the cloud, plus a veritable treasure trove of online services and conveniences everyplace we go. At home, in hotels, in restaurants and cafes, at school and in the office, wireless Wi-Fi networks help keep us all connected. And of course, at the gig, in the concert hall, in the theater, in the worship hall and sanctuary, and on the playing field, wireless microphones have become part of the landscape. For years, all of this wireless growth has had to find a home nestled in among the existing spectrum of television and other frequencies. But here’s the challenge: The wireless communication spectrum is a fixed entity with a finite number of frequencies. We cannot simply unspool or string up more frequencies, as we would with copper wire or fiber optic cables. The Federal Communications Commission (FCC), which governs the electromagnetic broadcast realm in the United States, has seen this issue coming for decades, and has taken steps to apply some remedies. Most of these FCC remedies apply to the UHF TV band, where many 600 MHz wireless microphone systems also operate. From its creation, terrestrial (non-satellite) television was broadcast as an analog signal. The analog TV spectrum ranged from 54 MHz up to 806 MHz*, covering Channels 2 (VHF) to 69 (UHF). Analog signals had limitations about how close neighboring frequencies could be packed together without causing destructive interference with one another, and often a “guard-band” of frequencies was used to isolate a signal from interference. These gaps between adjacent frequencies, local unused channels, and even these so-called guard bands became known as “White Spaces”, where peripheral devices – including wireless microphones – were free to operate. In June 2009, the FCC required all terrestrial TV broadcasts to be digital. At the same time, the digital TV spectrum was redefined as ranging from 54 MHz up to 698 MHz, covering channels 2 to 51. In addition to cannibalizing certain UHF channels, switching “over-the-air” TV broadcasts to the digital domain would free up even more bandwidth for mobile communications, white space devices, and yes, wireless microphones. Digital TV signals could be packed closer together without the risk of destructive interference, and the use of guard-bands was no longer required. By this time, many Americans already received their television signal via cable or satellite, and it was felt the elimination of certain UHF channels in exchange for the greater spectrum available for wireless communications would be well-accepted by the public. Incidentally, this was not the first time such a decision had been made. In 1948, Channel 1 was officially eliminated from the TV spectrum, with those frequencies held in reserve for land-based mobile communications. This portion of the UHF spectrum will be allocated to UHF Channels 14 through 36. 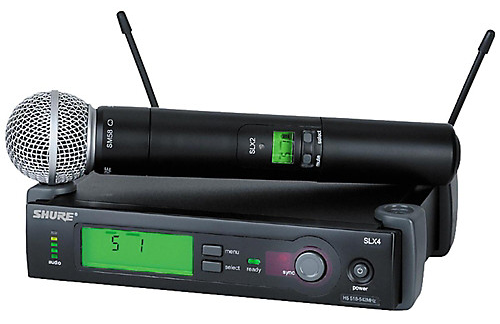 In addition, licensed and unlicensed wireless microphones (? 250 mW) may continue to operate in this band. Licensed wireless use generally applies to a fixed venue with a large number of wireless microphones in use, such as a major theatre or a football stadium. *In thirteen major U.S. cities, Public Safety communications may be operating on one or more select channels (14-20), so wireless microphone use should be curtailed on these channels to avoid conflict. Also known as UHF Channel 37, this band of frequencies is reserved for special uses such as wireless medical device telemetry and radio astronomy, plus white space devices. Set up and defined as a guard band, these frequencies are available to licensed and unlicensed wireless microphones of ? 20 mW. This area of the spectrum is reserved for mobile broadband use; no wireless microphone use is allowed. This area of the spectrum is split into two sections. From 653 MHz to 657 MHz, only licensed wireless microphones with a power rating of ? 20 mW are allowed. The frequencies from 657 MHz to 663 MHz are available for licensed and unlicensed wireless microphones (? 20 mW) and white space devices.